Feb. 9, 2019— Through no fault of their own, a lot of people get the wrong idea when it comes to heart disease. All too often, myths and misconceptions abound. Trouble is, misunderstandings can be downright dangerous when they get in the way of the heart-healthy truth. See if you've ever heard (or believed) any of these myths—and then learn the facts, courtesy of the American Heart Association and other medical experts. 1. Younger people don't need to worry about heart disease. Heart disease is more likely as we get older, but it affects people of all ages. What's more, your risk for heart disease can even start to climb in childhood. So it's not too soon to adopt a prevention strategy that includes regular exercise and a healthy diet rich in fruits, veggies and whole grains and lower in artery-clogging saturated and trans fats. 2. It's a man's disease. Actually, among women, it accounts for about 1 in 4 deaths annually, which makes it an even bigger threat than breast cancer. In fact, heart disease kills roughly as many women as men. But only about half of women know it's the leading killer of women in this country. 3. You can't have a heart attack without crushing chest pain. Chest pain or discomfort is a common heart attack symptom. But it's not the only one. Some heart attacks involve less-obvious symptoms, like shortness of breath; lightheadedness; or arm, jaw, neck or back pain. 4. If you work out and stay in shape, you won't get heart disease. Exercising does help protect against heart disease. But you can be fit and still have other risk factors, like high cholesterol, a history of smoking, high blood pressure or diabetes. Pay attention to your overall risk. 5. A heart attack is the same as cardiac arrest. They're two different conditions. A heart attack happens when blood circulation to the heart suddenly becomes blocked. But the heart usually keeps beating. In cardiac arrest, the heart suddenly stops when a malfunctioning electrical system throws off its rhythm. A person passes out and has no pulse. Both conditions are medical emergencies. If you notice heart attack symptoms (such as chest pain and shortness of breath), call 911. If you suspect cardiac arrest, call 911, and use an automated external defibrillator (AED), if possible, then follow with CPR until an ambulance arrives. If multiple people can help, someone should administer CPR until the AED is located. 6. Heart disease runs in my family. So it's just a matter of time for me. Having a family history of heart disease can make you more likely to develop the disease. But you can counter that excess risk. For example, you can choose to exercise regularly, avoid smoking, maintain a healthy weight and adopt a heart-healthy diet. These and other measures can go a long way toward decreasing your family history risk. 7. 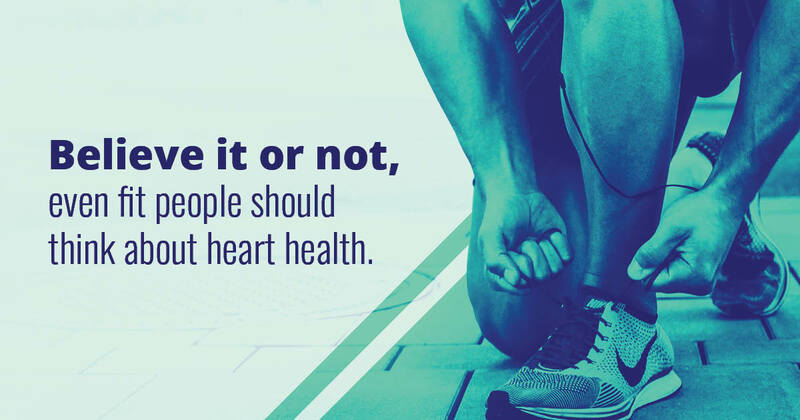 People with heart disease shouldn't exercise. Exercise is good for everyone, including people with heart disease—even those who've already had a heart attack. In fact, if you're a heart attack survivor, a doctor-approved exercise program may even help you live longer. 8. I feel fine, so I my heart must be healthy. You can have heart disease, or its risk factors, and not even know it. That's why it's a good idea to talk with your doctor about your risk for heart disease. Know your blood pressure. And find out if it's time for other tests, like cholesterol or diabetes screenings. Don't let a major heart problem be your first symptom. Discover more in our Heart Health topic center.